Wing span: 1 1/16 - 1 1/2 inches (2.7 - 3.9 cm). Identification: Wings are black or blackish brown. 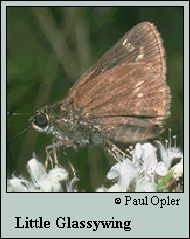 Upperside of male forewing has a large transparent white spot below the end of the black stigma and several other spots above and below it. Female forewing has a transparent square spot at the end of the cell. Underside of both sexes is black, sometimes with a purple sheen, and often has a few distinct pale spots. Life history: Males perch on low vegetation in sunny clearings to wait for females; courtship usually occurs around noon. Caterpillars eat leaves and live in shelters of rolled or tied leaves. Flight: One brood from mid-June to early August in the north; two broods from April to September in the south. Caterpillar hosts: Purpletop (Tridens flavus). Adult food: Nectar from white, pink, and purple flowers is preferred, including dogbane, selfheal, peppermint, joe-pye weed, and common and swamp milkweeds. Yellow flowers are visited when others are unavailable. Habitat: Moist places near shaded wood edges. Range: Central New England west to central Nebraska; south to northern Florida, the Gulf Coast, and South Texas.